We apply a ceramic barrier to the tops of the pistons to eliminate hot spots and to cause a faster and hotter burn. We also offer a more durable coating for engines using nitrous. The skirts, (with the exclusion of the ring lands), are coated with a ceramic, dry-film lubricant to guard against galling and eliminate friction. The inside (or underside) of the piston is coated with an oil-shedding thermal barrier coating to help return the oil back to the sump. Finishline coats the combustion chambers with a thermal barrier to keep the heat from radiating into the intake ports and exhaust ports. The exhaust ports are in turn coated with a thermal barrier to increase the volocity of the exhaust gasses - which in turn, scavenges the cylinders more quickly. The coating of the passages on the exhaust ports also cuts thermal transfer from hot gasses to the heads themselves. The head valley can be covered with an oil-shedding coating to speed the return of oil to the sump. In extreme applications, the outside surface of the heads can be coated with a thermal dispersant to aid in cooling the heads. 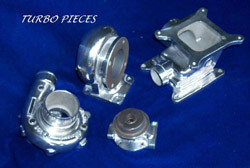 The valve faces are coated with the same barrier as the piston tops and combustion chambers. 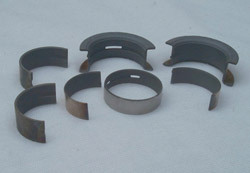 Valve stems are treated with a ceramic dry-film lubricant. Intakes are coated on the bottom with the oil-shedding coating to cut thermal transfer from the oil to the intake charge. The outside surface of intake manifolds can either be coated with our Cermachrome-polished aluminum look or, if extreme heat is a problem, our thermal dispersant coating. 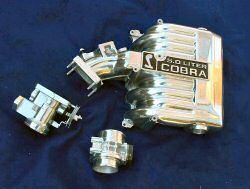 We also offer a Satin Silver finish to the exterior of intake manifolds for a “fresh aluminum” finish. The coating will withstand gas and oil without staining. Springs are coated with the moly coating, which aids in the cooling of valve springs and increases the life up to five times their normal life span. 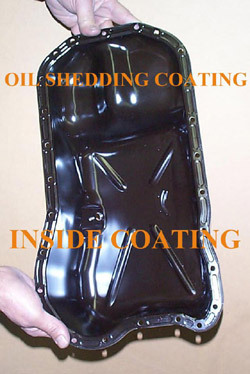 In inside is coated with our oil shedding coating to aid in the puddling of oil in the sump area. The outside can be coated in either our thermal dispersant to lower oil temps or Cermachrome for a show quality shine. The bearing surfaces are not treated, but the rest of the cam is coated with our dry-film lubricant to eliminate friction. They are coated with the oil-shedding coating to cut parasitic drag. Coatings cut down under hood temperature and decrease spool up time by holding the heat in the turbo. Bearings are coated with a special dry film ceramic lubricant that help to eliminate friction and holds enough oil film between the bearing surface and crankshaft surface for exceptional durability.